Different Zero Strain Temps in an Assembly? I'm trying to simulate an assembly where a top layer of silver is bonded to a bottom resin layer. What I want to do is have the bottom resin layer be stress free at 90 C, and the bond coat and silver layer stress free at 25 C. Is it possible to do this? My assignment is below if any additional info is needed. I completed questions 1 and 2, though my silver top coat is above the yeild stresses when at 180 C. I don't know whether this is intended to happen or not, but question 3 is the one I'm stuck on. Case Study #1 (Must work individually). Material properties as shown in Table 1. 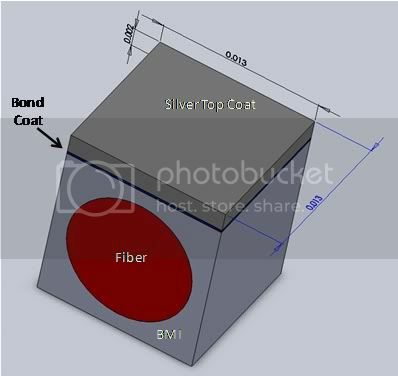 Problem: Design a bond layer with appropriate properties such that the metallic coating adheres durably to a polymer resin or a polymeric matrix composite. No external loads or constraints on the material. Only symmetry and periodic conditions. State your assumptions. Components cannot fail statically – All stresses must be lower than failure stresses. Low Stress = High Durability. Bond coat cannot be thicker than top coat. Deliverables: A detailed report on the design process used for obtaining the solution and screen shots of key results. Clearly state all assumptions. Your answers must be clearly identifiable in the report. Question I: Determine the modulus and thickness of the bond coat layer that maximizes durability for pure BMI base substrate when the material operates at an elevated temperature of +180 0C (Note: Set the properties of the cylindrical fiber same as that of the BMI resin). Assume that the coating, bond layer and the base are stress free at +25 0C. Determine the mass percent added to the base substrate as bond and silver coating layers. Question II: Determine the modulus and thickness of the bond coat that maximizes durability for a carbon fiber reinforced composite under the conditions stated in Case I. Table 1: Properties of the materials. Re: Different Zero Strain Temps in an Assembly? Anyone know how to make different zero strain temperatures for different parts within an assembly for the purposes of a stress simulation?